If you are looking to fill your pots and containers with a plant that always sings for it’s supper, Feather Falls is the plant you’re looking for! Feather Falls has a beautiful habit. As it plumps and thickens its variegated, grassy stems curl and twist gently downward, it’s lush and textual and always interesting. Feather Falls has great appeal planted on its own and is super happy to be combined with other plants. Hardy and easy to care for, this is a super duper plant, that minds it’s own business, it is a lovely non invasive grass that will delight you. What a gorgeous little treasure! Nemesias are petite, pretty little plants, that are perfect for pots and containers. Plant them as border plants, or hem the edge of a path or corner that needs a some fragrant colourful cheeriness. Work them into combination plantings or fill a planter bowl for the outside table, the sweet fragrance of the nemesia will lift your spirits. Rhubarb and Custard is a long lasting, flowering pot of colour, tuck it away from frosty spots and it will flower for weeks and weeks. This is a super new version of one of the great hedging plants of our time. Wonder hedge is what we call a set and forget hedge. It is tough and once settled will tolerate periods of dryness, it withstands frosts, it is resilient and disease resistant. 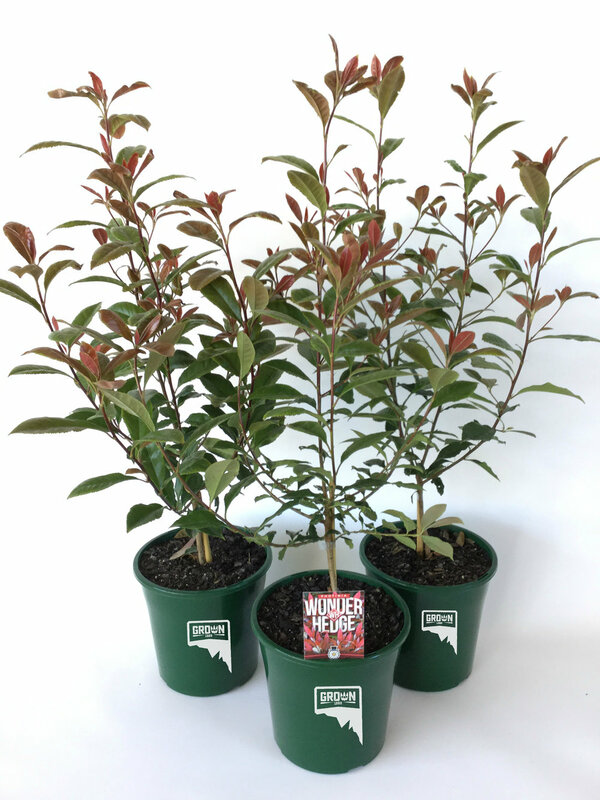 The stunning red colour on its new growth will create interest and appeal all year. Wonder hedge is a unique plant that has a “self branching” habit, this reduces the need to prune the plant, it will form thick, tight hedges, without too much effort from you. Plant at 3 per metre to create a thick, marvellous set and forget hedge..